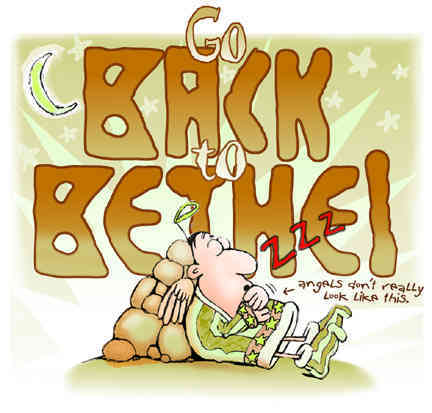 Bible Stories for Kids - Go Back to Bethel! Its easy to forget to pray. Its easy to forget all the good things God has done for us, and to forget to thank him every day. Its easy to get so busy doing homework, and playing video games, and watching TV, that pretty soon we dont have time for God. The funny thing is, even though God has to run the entire universe, he always has time for us. God would never rather sit and watch TV than spend time with us. God is never too busy playing video games. He would always rather be with us. We are the most important thing in the world to God. But so many times we let other things become more important than God. Thats what happened to Jacob. Bethel? Bethel? Why Bethel? Jacob kept asking himself. Bethel was the place he camped that one night, and used a rock for a pillow. Remember? How could he forget that! Jacob had a dream there. God let him see the other part of the world that we never see. Thats where Jacob saw a stairway going to heaven, with the angels of God coming and going to earth. When Jacob woke that next morning, he made a promise to God. And he saw golden statues all around the place. They were statues of the gods his neighbors worshipped. Somehow, little by little, one by one, Jacob and his family had brought all these statues into their tents. And now they were everywhere. At that moment Jacob realized that he had let all the things that other people think are important become more important than God. And so that very day, Jacob and his family dug a hole in the ground and they dumped into it all the worthless things they had let take over their lives. Jacob and his family came back to God. Here I am! Jacob said. But this wasnt just a promise to Jacob. It is a promise to us too. One day a king would be born from Jacobs family. He will be the King of Kings, and the land that he will rule, he will rule forever. That King is Jesus, and he will be our king, and we will live with him forever in heaven. That is Gods promise to us. And God never forgets his promises. The story of Joseph begins!